Paros is an island of Greece in the central Aegean Sea. One of the Cyclades island group, it lies to the west of Naxos, with which it is separated by a channel about 8 km (5 mi) wide. 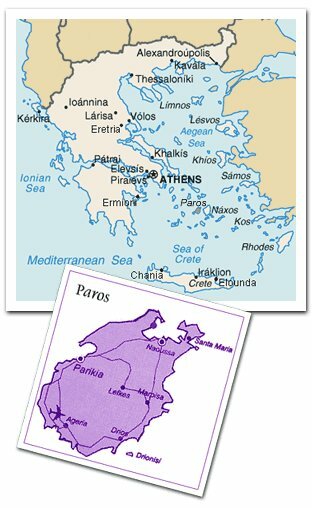 It lies approximately 100 nautical miles (185km) south-east of Piraeus (Athens port). The Cyclades archipelago is sea kayaker's dream. Paros island in particular offers many paddling opportunities. The coastline here offers many beautiful beaches and coves that can be explored by sea kayaks. The Municipality of Paros includes numerous uninhabited offshore islets totaling 196.308 square km of land. Its nearest neighbor is the Community of Antiparos, lying to its southwest. We are based in Aliki, a small fishing village south of Paros. We usually explore the small coves and islets between Paros and Antiparos.